With industrial resources stretched to the limits in France (after the loss of the eastern Lorraine region in 1914, which accounted for a large part of the heavy industry) and Great Britain, (due to massive debt, labor shortages, steel diverted for shipbuilding) the news that the USA entered the war was received with great hope. Soon after April 1917, the British planned to send a delegation to the USA to convince them to co-produce the next British tank model. But soon afterwards it was thought more judicious that the initiative should be led locally and endorsed by Congress. Via the American military attaché in London, some contacts were made with the US Navy for the Marine corps, based around the next project available, the Mark VI. However, the latter was tailored for the capacities of the British industry and relatively small. Therefore, Lieutenant-Colonel Albert Gerald Stern proposed the Tank Mark VIII, fictitious at the time, a much bigger design. Meanwhile, the American Department of War intervened and asked that the model be developed for the US Army and sent Major H. W. Alden to the Mechanical Warfare Department design team at Dollis Hill. He arrived in October to find that much of the plans had already been made by Lieutenant G. J. Rackham, a veteran from Flanders. 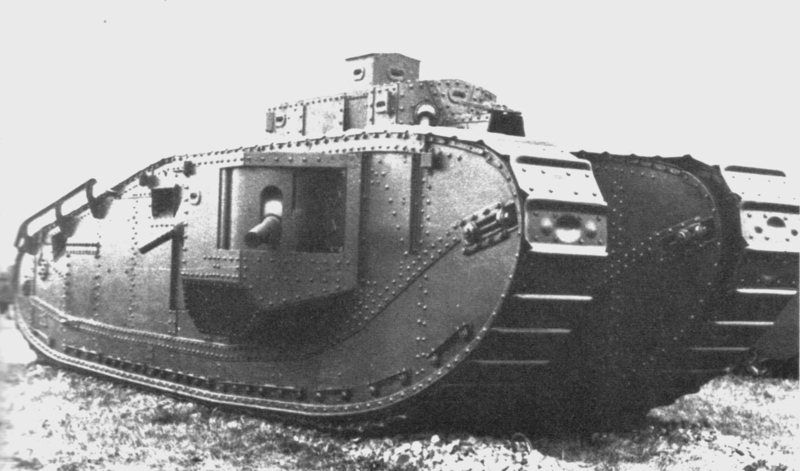 The Mark VIII had similar features to the British-built rhomboid tanks, with full-length high track run and large track links, sponsons, and raised superstructure at the front. The latter housed three Lewis machine guns in ball mountings, while the driver had a small raised cabin or cupola with four vision slits. The sponsons housed two 6-pounder (57 mm) guns, while two hull machine-guns in ball-mounts were placed just behind on the hull doors. Other great improvement was the engine compartmentalization through a bulkhead, preventing noise and fumes from invading the fighting compartment. The hull form was studied after reports and much rounder. The sponsons were made retractable to reduce the width for transport, which was in itself fairly limited compared to the total length of the hull. This would later cause serious agility issues. The ammunition (208 shells and 13,848 machine-gun rounds) was stored inside a large locker on the fighting compartment platform where the crew stood. The US Liberty V12 (replaced by the Ricardo equivalent on the British design) was fed by three armored fuel tanks at the rear holding 200 L (240 US gallons), ensuring a 60-80 km (37-49.7 mi) ride on rough terrain. The sheer length was intended for assaulting the new German anti-tank trenches and ditches of the Hindenburg line, and possibly to carry twenty infantrymen (thus performing as an APC), added to a crew of twelve. The hollow British prototype was ready in June 1918 and later shipped to the USA for completion in September, by hand-built components. During trials the links failed frequently and had to be strengthened, lengthened and reshaped, in hard cast steel before production. Protection was better than average, with frontal and side thickness of 16 mm (0.63 in). The gradual set-up of the production was a long an protracted affair. By September 1917 the US Army HQ in France planned its own tanks corps with French and US-built Renault FTs to equip 20 tank battalions, while five heavy tank battalions were to be given the new Mark VIII. James A. 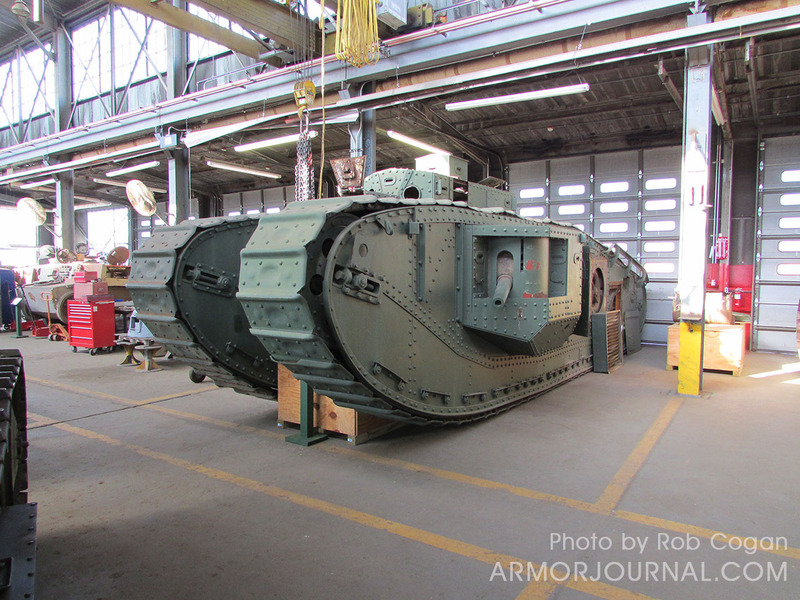 Drain from Gen. Pershing’s staff initially ordered 600 Mark VI tanks (then in development). Later on, Stern was removed from the project by Churchill (the Mark VI was eventually cancelled in December) and instead was sent to study tank production in France, consulting both the French Minister of Munitions, Louis Loucheur, and Gen. Pershing. However since French production capacities were severely limited, they devised a ten point agreement stating the component production would be separated between Great Britain and USA, and final assembly performed in France, in a brand new factory which had been built from scratch. The new project was named the Mark VIII “International”. The projected figures of 1,500 heavy tanks had to be then shared among the Allies, including France, whose own project Char FCM 2C had barely advanced at all. Later on 11 November the name was changed again to “Liberty” in relation to its US-built 300 hp (220 kW) Liberty engine. Initial production figures stated that 1,200 vehicles could be produced monthly after extensions of the facilities. This proved way too optimistic. The British-built factory at Neuvy-Pailloux, 200 miles south of Paris, was not even completed by June 1918. Another company was hired and did finish the factory in November, but the war was over then and the whole project was suspended. Meanwhile, the Liberty engine had its piston recast and was only available in October. US component production was also not ready before October. Armament from the UK was fixed and tested later in November. Due to the end of the war, the needs for the Mark VIII dwindled rapidly. Nonetheless, due to the effort and money already spent, the Congress authorized the production of 100 tanks for US needs, built on US soil and partly British components. These were delivered between 1919 and 1920 by the Rock Island Arsenal at 35,000$ apiece and served with the 67th Infantry (Tank) Regiment, based in Aberdeen, Maryland. These were the only heavy tanks in US service until the arrival of the M6 in 1942. The side machine-guns were later eliminated to have a peacetime crew reduced to ten, and all machine-guns were replaced by M1917 Browning models. They suffered from poor engine ventilation and reliability issues, phased out in 1932 and in 1934 were placed in reserve. The first British-built Mark VIII was delivered the day of the armistice, with a mild steel hull and Rolls-Royce engine, but ultimately seven more were completed (out of a 1,500 unit order to the North British Locomotive Company and William Beardmore & co) with the definitive V12 Ricardo engine. With extra sets of parts, twenty-four more were built after the war, with five sent to the Bovington training center and the others ultimately sold for scrap. The lengthened Mark VIII* (star) projected late in 1918 was supposed to be even longer, with the rear and front section of the fighting compartment stretched by a total of three meters. 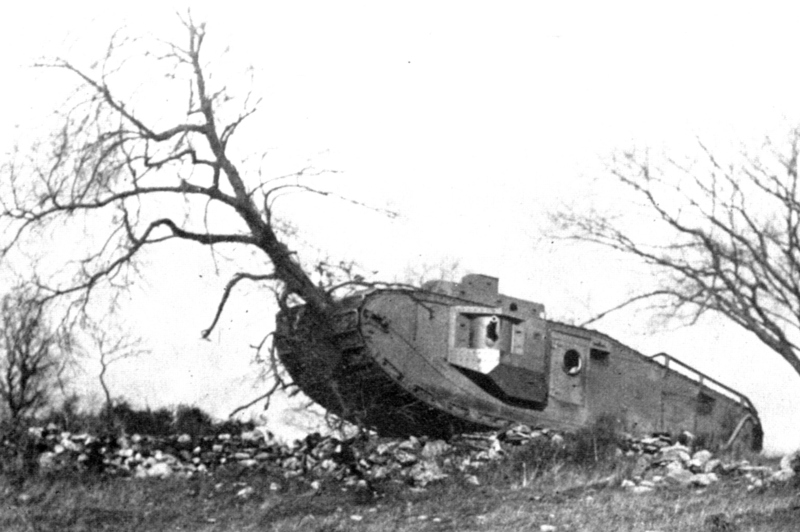 This would have allowed it to cross anti-tank ditches up to five meters long. 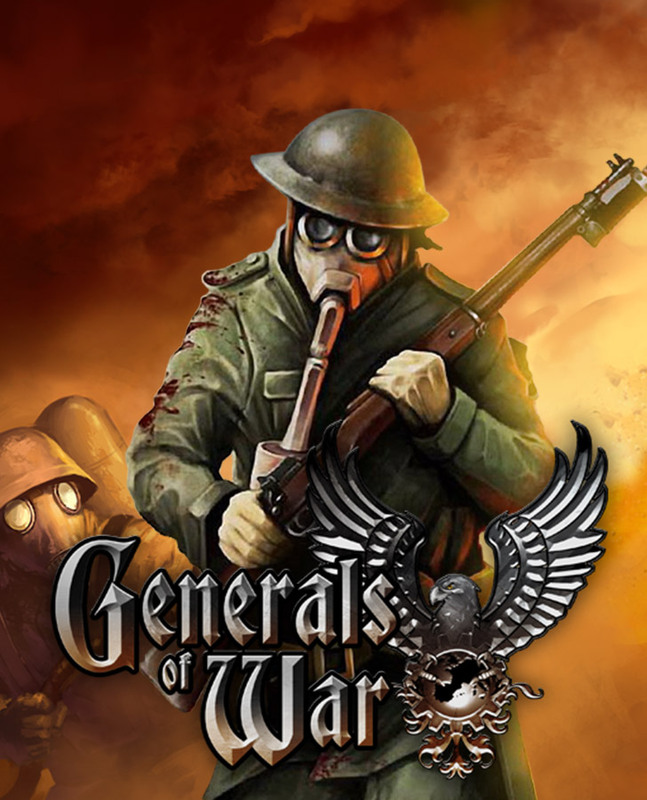 Production was cancelled soon after the armistice. Surviving vehicles are on display at Fort Meade, Maryland, and at the Bovington Tank Museum in England. A further example is being restored at the National Armor and Cavalry Museum, Fort Benning, Georgia. In Steven Spielberg’s movie ‘Indiana Jones and The Last Crusade’, a tank vaguely resembling a Mark VIII is seen, but with an added turret on top. It is often said that in 1940, the surplus Mark VIII Liberty tanks in USA Army storage were sold at scrap value to Canada for training. This is wrong. They were offered for sale but that offer was declined. 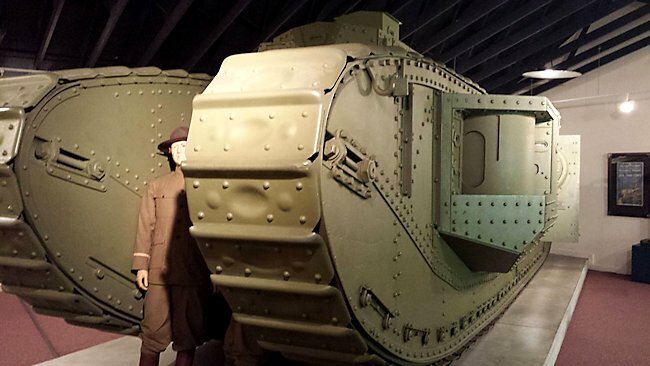 The Canadian Army purchased 236 American M1917 tanks for training tank crews instead. These were licensed built WW1 Renault FT tanks. Dimensions Length 34ft 2in (10.42m). American Mark VIII Liberty, US Infantry’s 67th Armored Regiment, Aberdeen, Maryland. Prospective view of a British Mark VIII, as it could have looked if deployed during the great summer offensive of 1919. I’ve always been interested in WW1 aircraft. 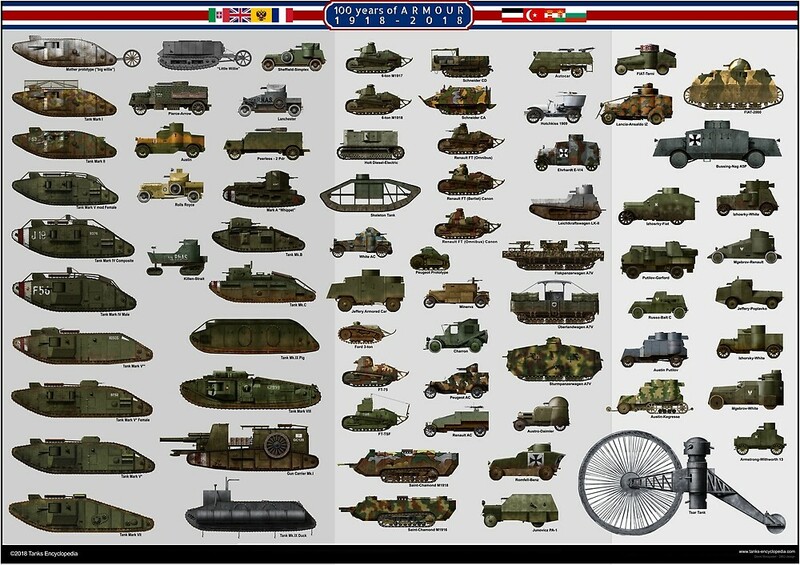 But tanks are truly amazing because they didn’t exist before the war and this shows how much progress was made in such a short time.